"With import prices down some 19% yoy and even a record 7.3% yoy if one excludes petroleum, no wonder the price of domestic purchases has already fallen into deflation. If anything, domestic purchases inflation leads trends in both GDP and core CPI, so this is significant news." "But what about massive supply of government bonds I hear you ask? Won't that drive yields higher? Well it never did in Japan. But let's cast our minds back to the early 1990's US credit crunch (which seems so minor in retrospect!). What happened then is that US commercial banks bought US Treasuries aggressively at the same time as they contracted lending to the private sector (see chart below). This continued well after the end of recession in early 1991." David Rosenberg has been outlining some similar deflation themes in recent newsletters as well. "Despite all of the talk and expenditure in Washington, the US banking industry is still sinking steadily and neither the Obama Administration nor the Federal Reserve seem to have any more bullets to fire at the deflation monster." So what exactly does this deflation threat look like and how does it compare to historical episodes of deflation? I decided to take a closer look at some of the data myself, and I'll share some charts below. First, a clarification of what is meant by "deflation". While most people think of it as a reduction in [consumer] prices, others, for example Austrian economists, define it as a "contraction of money and credit", and this is a valuable viewpoint in part because broad money supply changes often precede changes in consumer prices. Both total private sector borrowing (see chart here) and bank credit (see chart here) have been contracting so far in 2009. Then there is of course asset price deflation, and there is no question this has been significant since the crisis began, for both real estate and stock market prices, and that this is one driver of reducing spending. 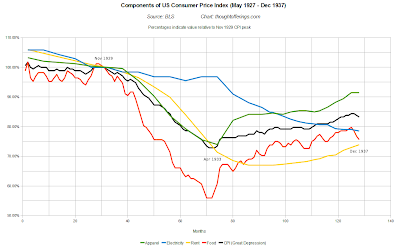 This post focuses on consumer price inflation/deflation, even though the other measures are probably more important in general to understanding the macroeconomic trend. CPI has been measured with different methodologies at different times, so this is not an apples-to-apples comparison. After peaking in July 2008, headline CPI plunged at a faster rate than the onset of the Great Depression. No wonder (among other reasons) treasuries rallied so dramatically at the end of 2008 and then reversed as headline CPI started heading higher again! Core CPI (excluding food and energy prices) has kept rising, but the pace of increase is slowing in 2009, even with energy prices relatively stabilized, despite coinciding with the largest monetary and fiscal stimulus in history! Is the battle with the "deflation monster" being slowly lost? Looking at the BLS year-on-year CPI chart further above, the trough in the rate of change of core CPI of around 1% in early 2004 was almost four years after the dot-com stock market bubble popped, and over two years after the recession lasting officially from March 2001 to November 2001 ended! So (at the risk of being wrong by using only one data point) impacts to core CPI seem to lag recessions and changes in asset prices by years. It seems likely that this trend will replay today. Headline CPI has turned (mildly) negative again in July — will a full downward trend resume? 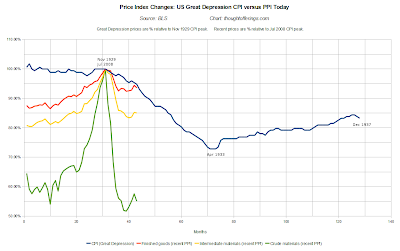 Might we face price deflation as ferocious as in the Great Depression? Personally I think it unlikely, but can't rule it out entirely. I added energy prices to the graph because they have been so volatile (whether due to global demand exceeding supplies, rampant financial speculation in energy as an asset class, or some combination of both). One way of looking at the effect on headline CPI is that the violent energy price spike simply forced headline CPI higher between mid 2007 and mid 2008 and that this is the primary cause of current deflation. While partially valid, I don't think that's the whole story. Leading up the the minor peak of CPI in November 1929, all price measures except food were already in a couple years of moderate deflation. Could that have made them susceptible to rapidly tipping into a self-reinforcing adverse feedback loop of severe deflation when the economy was hit by the deflationary shock of contracting credit and falling asset prices? As prices declined, food fell the most dramatically (almost down to half its peak price), dragging down the overall CPI. Is this analogous to commodity prices today? It's my guess (without any specific knowledge) that food prices back then tracked more closely to pure agricultural commodities, if there was less processed food, restaurant food, etc available. Electricity prices did not deviate from their mild downward trajectory until overall CPI bottomed after several years — perhaps they were effected by regulation, high labor costs, or some other factor? Most of the components with smaller weights (medical care, recreation, education and communication, other goods and services) have still been trending higher. Apparel has been remarkably flat for years (recently trending up) — I would have guessed we'd see more deflation in these prices. Housing is the largest category (weighted 43% of CPI) and it appears to be in a gradually accelerating downward trend. I (and others) expect this to intensify in the years ahead, thus dragging down overall CPI due to the heavy weight. Rents and owners' equivalent rents are heavily weighted, and they are starting to decline in the real world due to the huge excess supply of housing built over recent years with more and more being added to the rental market, as well as recession-specific factors such as more people sharing housing or apartments to save money rather than living alone. I have read that this CPI component lags real world changes in rent. 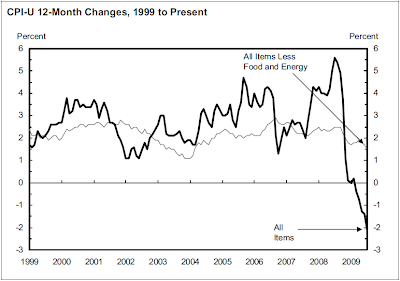 Food is the second largest category (weighted 16% of CPI) and it also appears to have started a mild downward trend. If this continues, it will also pressure the overall CPI downward. Transportation is the third largest category (weighted 15% of CPI) and it already fell precipitously and has been gradually rebounding. maintaining upward pressure on CPI. Will it keep rising, level out, or start falling again? Any change from the current upward direction could have an out-sized impact on CPI, given that this has been the largest weighted component in a rising trend in 2009. Producer prices have fallen at a far more rapid pace since peaking in July 2008 than consumer prices during the onset of the Great Depression. They have stabilized but not resumed a convincing uptrend. With such a dramatic divergence between crude, intermediate, and finished goods measures, clearly the enormous upward spike in crude goods prices prior to July 2008 has made it easier for there to be a rapid decline following the peak, so it may not be worth putting much weight on this graph, except as food for thought. 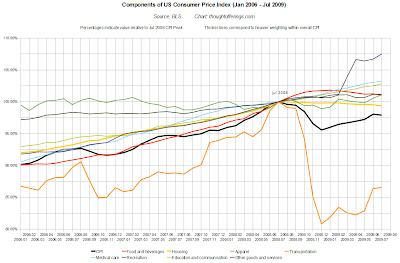 However, some observers suggest that PPI is a predictor of future CPI. While I won't go so far as to predict it, it would not surprise me if the China growth story (which has numerous skeptics with convincing arguments) falters within the next year or two, leading to a fresh crash in commodity prices. Could this tip PPI and later CPI into a downward spiral? I used January 1990 (the peak of Japan's stock market bubble) as the anchoring point for Japan's data because there was no CPI peak at the start of their 1990s "balance sheet recession" (note I made a mistake graphing and the Japan data is shifted 6 months to the right in the chart from the anchor point.). I am surprised at how long it took the inflation rate to decline — it took 3-4 years for price levels to begin to flatten out. Even into the late 1990s, there was still no real price deflation, despite a huge deflation in asset prices. Japan's real estate prices peaked around 1991 (according to Richard Koo's presentation graphs) so perhaps the delay between peaking asset bubbles contributed to sustaining inflation. Nevertheless, there was disinflation (falling positive inflation), so in hindsight I should have aligned the different series for all these graphs via the peak year-over-year CPI rate of change rather than the peak price level itself. Is the Great Depression experience or the Japanese experience more relevant for the US and the world today? 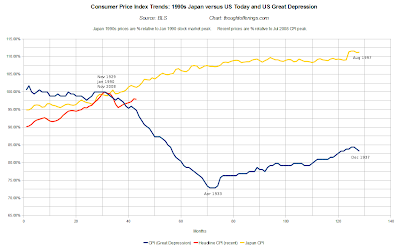 I don't know the answer, but I would guess price inflation/deflation dynamics will be closer on the spectrum to the Japanese experience than to the Great Depression, though I think the dramatic price decline scenario could occur. With practically the entire world simultaneously awash in excess capacity and experiencing debt deflation (contraction of debt levels due to private sector deleveraging), the underlying conditions are certainly closer to those of the Great Depression, which was the last global debt crisis. But will developing countries such as China achieve sustainable growth in the next few years and provide a backdrop of growth much like that which surrounded Japan post-1990? On China at least I am skeptical. The key question, to which most observers believe the answer is yes, is will structural differences in modern economies (versus the 1930s) or differences in government responses be able to avert severe broad price deflation this time? I sincerely hope the majority is correct for a change. UPDATE 9/7/2009: A commenter pointed out that it may be too early to tell the effect of stimulus on core CPI, which is true. The data I've shown is not conclusive with respect to any future outcome. However, in the context of contracting private debt and the trends I've discussed before I'm predisposed to expect the types of outcomes described by the likes of Steve Keen (who builds on the work of Hyman Minsky among others) and Richard Koo (author of the phrase "Balance Sheet Recession"). Although GD1/US and Japan show that deflation can occur even when inflation expectations are well anchored, your charts suggest that one key difference for both of these exporting nations was the vibrancy of the world economy around them. As such GD2 is obviously hanging on a 'dragon thread' ... will the growth driver that is China continue or will China undergo a creative destruction commensurate with the creative statistics that they have reported. Of course that simple 'thought offering' neglects the dynamic that Japan was supported by strong export markets. In GD1, America was not. The underlying metric that connects all your charts is income. 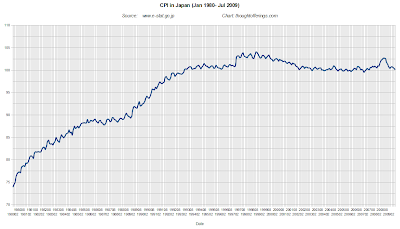 GD1 and Japan both saw stagnant and declining wages, simliar to today. In both scenarios public debt was not able to completely offset private contraction and recovery, or lack thereof, was driven by increasing incomes. Since we seem hellbent on solving our debt crisis with more debt which , ironically, should exacerbate the balance sheet deleveraging, it would not appear that increasing domestic incomes will be a larger driver. Increasing incomes from the BRICs is heralded as the global stick save, but since they are still coupled to the US and Europe, it would seem unlikely that we will be allowed to limp along on their largess. In fact one might suggest the BRICs will take it the hardest unless there is a V in their exports markets.. The authorities in the US it would appear believe that the Japan scenario is our best alternative ... mild deflation thanks to the surging import markets of the emerging world. That will buttress us until employment tightens providing that lubricant of inflation. Before we get to that idealized state I would suggest that there will be a dead zone. A zone where the deflationary shock of the new normal of the worlds' largest consumer crashes into the limits of substituting private demand with public. We are refusing to deal with the debt problem, hoping that we can do what we have done for the last 30 years...reflate and paper over our wealth transfer to exporting nations. Alas, all 'good things' must come to an end. Am providiing a link to you on my blog looking forward to your future posts. The careful charting is a real plus. Re your prior post on Treasuries, I agree. And a cyclical improvement in corporate profits and (someday) wages will shrink the deficit and there could be a (relative) shortage of Govt debt at a time when corp's aren't investing for growth and inflation is cyclically bottoming. Great post. Like Anonymous Monetarist's comments also. I don't see global recovery for a generation. We need a population gain to provide the demand for the current supply. The BRIC's and all Western nations are sucking on a straw in a cup of stimulus. But the cup is getting empty. Thanks, very interesting post. You can probably get the 1929 CPI weights by calling BLS. They are usually very quick to send out information. Part of the moderation of the housing index is due to the decline in energy prices, and of course that's a big part of the wildly-gyrating transportation prices. One quibble with one of your (implied) conclusions: in this environment, core CPI is what matters, given that energy prices have been so volatile, and food prices were jacked around by ethanol. Your graph seems to indicate that core CPI is continuing on an upward trend. So one the one hand, yes there has been no increase in inflation despite a highly inflationary monetary policy (and good reasons why that has not happened), but on the other hand, there wouldl be no indication (yet) that the battle is slowly being lost. Too early to call. Let's see what happens when the stimulus spending wears off! Thanks for the thoughtful comments! (With which I am largely in agreement). As I see it, my implied conclusion was that Japan-style deflation (which took 8 years to begin after their asset bubbles peaked!) is likely a "best case" scenario, with the probably of the many degrees of "worse" being complete guesswork but not out of the question given the underlying dynamics. This conclusion is based as much on the content of my past posts as on what I presented here. You're right I should have explicitly called out the possibility that true recovery and reflation could take hold (perhaps with a lag as shown in CPI) but I tried to show the data in as neutral a way as possible and let people draw their own conclusions as well. Again in my opinion I don't expect the trend in core CPI to change direction unless total borrowing and/or total bank credit (two of the charts I linked to) start expanding again, and they haven't done so (the total bank credit report is weekly) even in the face of such massive stimulus. Of course I could be overlooking other factors that could matter more in the end (global supply shocks, monetary velocity surges, etc). 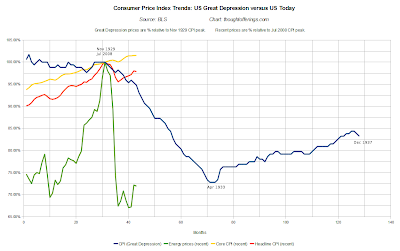 One other implied conclusion that I should have called out more explicitly (even though I mentioned it once mid way through) is that at the onset of the Great Depression most price measures were already deflating, so it may have been much easier for popping asset bubbles and contracting debt to push the economy into its self-reinforcing downward spiral. Given the upward trajectory of inflation before the shocks this time around, perhaps the "momentum" (if such a concept is relevant) will buy enough time to avoid any downward spiral. Or perhaps not... I have more data than defensible conclusions. I have a small point about about food prices during the depression. Specifically grain prices in the US were wildly inflated by the collapse of agriculture in Europe during WWI as the farm workers went to the trenches. And then after the war, the Russian Revolution/Civil War plus ongoing chaos through out Europe meant that it was a while before grain production in Europe got back to normal. This created a bubble in US grain prices and part of what you are seeing is the price overreacting on the downside to the oversupply that always occurs during any bubble. Additionally a major component of international finance in those days was moving money, actually physically moving gold, between Europe and the US to pay for the grain exports. Bruner and Carr's The Panic of 1907 has a section on this. I am not sure how much gold was still being moved around by the 20's but the collapse of international money flows meant that closing international markets for grain, regardless of Smoot Hawley, which would mean a massive glut of grain in the US. Not sure how much you can extrapolate from grain prices in the US during the depression to commodities today. It was a unique set of circumstances. Anon 3:10pm - The historical context is very helpful, thanks. I think if anything the idea that grain was in a temporary bubble with the price collapse apparently contributing to the deflationary spiral makes it MORE analogous to today (though the trade shutdown part is currently less comparable). The real question then is are commodity prices now in a temporary bounce (the resumed reflation trade combined with massive government-sponsored spending especially in China) or have they already bottomed... The crude PPI measure seems to have fallen so far that it's hard to imagine a fresh plunge from here, but on the other hand it is just back to the level of two and a half years ago when global economies were still expanding, so I don't think another fall can be ruled out, depending on what happens to emerging economies and to risk appetites. Thats a fair point and from that perspective it does look very similar. But from an impact to our economy point of view, I dont think it is the same. It would be very hard to find anything in todays US economy that would have the same devastating effect on todays US economy that the collapse of food prices had on the US economy of the 20's. (maybe housing? uh oh...) Ag was a much bigger part of the economy and the US was the worlds leading exporter. In general, as the worlds net exporter in the 20's, the China of the day, we had most of the worlds excess capacity and when the draw bridges went up, we were stuck having to work off the surplus by ourselves. In general, I would think that deflation in commodity prices would be a net benefit to the US economy today. Especially if we got it in energy. Very hard on Australia, Canada, OPEC, people who export commodities but good for us. Yes it would still be hard on farmers in the US but they are a much smaller part of the economy today. One of the few advantages of running trade deficits is that when all this unwinds, it hurts us much less than the people who ran surpluses. As we learned in the Great Depression, it is much easier to default on debts (which the Europeans did back then) than it is to clear surplus production. Anon 3:10 - Good points... that may be one of the more meaningful structural differences between then and now.